Temporary employment has become a focus of policy debate, theory, and research. The book addresses as its core concern the relationship between temporary employment contracts and employee well-being. It does so within the analytic framework of the psychological contract, and advances theory and knowledge about the psychological contract by exploring it from a variety of perspectives. It also sets the psychological contract within the context of a range of other potential influences on work-related well-being including workload, job insecurity, employability, and organizational support. A key aim of the book is to identify the relative importance of these various potential influences on well-being. The book covers seven countries; Belgium, Germany, The Netherlands, Spain, Sweden and the UK, as well as Israel as a comparator outside Europe. Data were collected from over 5,000 workers in over 200 organizations; and from both permanent and temporary workers as well as from employers. The book's conclusions are interesting and controversial. The central finding is that contrary to expectations, temporary workers report higher well-being than permanent workers. As expected, a range of factors help to explain variations in work-related well-being and the research highlights the important role of the psychological contract. However, even after taking into account alternative explanations, the significant influence of type of employment contract remains, with temporary workers reporting higher well-being. 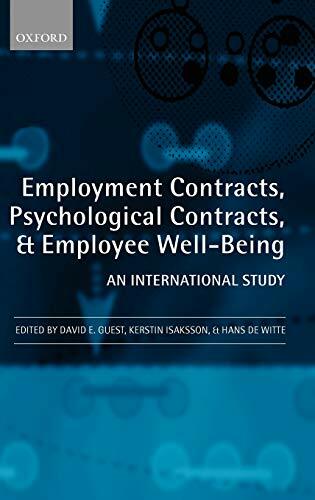 In addition to this core finding, by exploring several aspects of the psychological contract, and taking into account both employer and employee perspectives, the book sheds new light on the nature and role of the psychological contract. It also raises some challenging policy questions and while acknowledging the potentially precarious nature of temporary jobs, highlights the need to consider the increasingly demanding nature of permanent jobs and their effects on the well-being of employees. David Guest is Director of the Workforce Programme of the NIHR Patient Safety and Service Quality Research Centre at King's College, London and Director of the King's College Centre for Research in Human Resource Management, Employment Relations and Organizational Behaviour. His research has addressed a range of issues including: the relationship between human resource management, organizational performance and workers' well-being; the role of the psychological contract in employment relations; the scope for and impact of participation and partnership at work; the future of the career. He has published numerous articles, book chapters, and reports. Kerstin Isaksson is a licensed psychologist with a Ph D in psychology from Stockholm University. She worked at the Department of Psychology in Stockholm until 1997 as a researcher. Between 1997 and 2006 she had a position as researcher in the National Institute for Working Life in Stockholm. Her current position since 2006 is professor in psychology at Mälardalen University. Professor Isaksson's research has focused on issues such as: unemployment, early retirement, downsizing, and job insecurity. In recent years, temporary employment and the psychological contract have been the focus of her research. She has coordinated several large national and international collaborative projects. She has been the coordinator of the PSYCONES project supported by EU Fifth framework programme since the pilot study in 2002 until the end of the project in 2005. Hans De Witte is a full professor at the Department of Psychology of the Katholieke Universiteit Leuven, Belgium. He teaches Work (and Organizational) Psychology and is member of the Research Group Work, Organizational and Personnel Psychology (WOPP) of his Department. His research includes the study of the psychological consequences of job insecurity, unemployment, temporary employment, and downsizing, as well as mobbing and stress versus engagement at work. He participated in various national and European studies on these topics.